This modern and contemporary "Visual Pattens" tapestry shows the work of artist Linda Thompson. This work in ingenious in that there are multiple elements overlaying each other to produce a work that stimulates the senses. See the beautiful and distinctive moss green in the left center area, which differs from the browns, golds, earth reds. The color interplays with differing shapes of squares as well as elegant wrought iron like designs and finally with strips of grass like pattern across the scene to add to the sophistication of her design. A beautiful work in every respect in a modern piece. 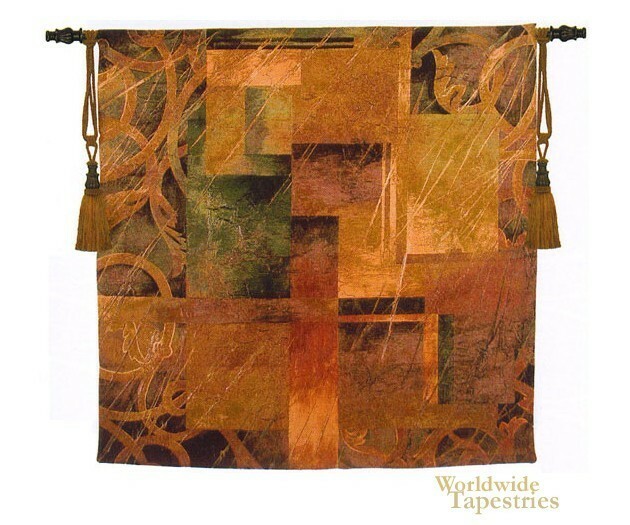 This modern and contemporary art tapestry "Visual Pattens" is backed with a lining and has a tunnel for easy hanging. Note: tapestry rod and tassels, where pictured, are not included in the price.